2012 Reflection: Why Can't We (i) be as Harsh & Caustic as A.A. Gill? What do you think about food bloggers/writers? I know that some might ridicule us as free-eaters / freebie hunters / or simply pricks who brag about what we eat. Do they think we praise a restaurant and help them with marketing in exchange for free food or even for a fee? Really, do we seem so cheap? 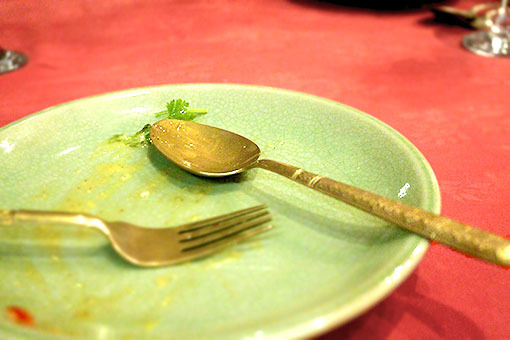 Mum always taught me: not to leave anything on my plate, not even a grain of rice. There is a growing obsession to take photos of food before eating and some even take the trouble to edit the photos to look decent, and add some informative narration, and share it with public in a personal blog. Because we share such information, all we have to do, to look for an address / phone numbers / review about a new place, is just search the Internet. I bet most of us have searched for a restaurant and look around food blogs to check if a place is worth visiting? First of all, liking and preference is an acquired taste. We have our Mothers to thank for that. Imagine a kid whose mother is a terrible cook, practically anything he/she eats would taste good, right? What if that kid's mother serves a bountiful & heavenly spread each meal since who-knows-how-long? Anything that's not up to that would be considered trash, obviously? If some feel a food blog only seem to praise practically anything the author posts, there might be 2 possibilities: either this blogger is very lenient in terms of taste preference, or the blogger simply only publish good recommendations and keep the bad experience to him/herself and not for public sharing. Secondly, a business most likely means someone's lifeline. Imagine if someone's harsh and unnecessarily bitter review is so believable and so potent to make a business close, that a handful of poor hardworking folks must be left jobless, just because the soup is too thin or the chili in the food is too hot? I wouldn't want that on my conscience because I wouldn't want anybody to do that to me either. Remember a proverb, "do unto others what you want others do unto you"? Furthermore, it's a lot more humane and ethical to tell someone's flaw right in their face, rather than secretly reproach them worse in the Internet, This way, they'll be able to improve immediately and it's more fair for them, nobody else need to know about the problem. No one's embarrassed and everyone walk away dignified and happy. This is especially important, because the Internet is like a fertile ground for bad news, it travels faster than light and only get worse from one person to another, like a plague. Always think before sharing anything online, we may not intend anyone harm, but it often spins out of control and bear in mind that regret can not fix a spoiled milk. Next, some food bloggers (including me), prefer to approach food objectively. What I mean is I will always let the food and the creator prove itself / himself via the food he created. Every dish has its own beauty that may not come across as straightforward, subtle or sometimes perhaps non. It's just like human beings, just because one is not good looking, doesn't mean it's not kind or smart. Too bad, we aren't born with identical taste buds, so it is impossible to standardize flavours. After all, one man's trash is another's treasure. What is distasteful to one, might be a heavenly treat for someone. I hope I got my point across, the bottom line is, for my dear readers and visitors who expect me to be harsh or to criticize some chef or restaurants, I'm sorry to say that it will unlikely happen, at least in the foreseeable future. I blog about food for pleasure, it's not a job and it's an avenue for me to share the delights and information about places / food I've tried. Alas, I wish you a delicious and festive new year, let's raise our glasses to welcome an even more sumptuous 2013! Cheers!